Vape pens are on the rise amongst teenagers who want to experience the thrill of doing what's socially looked down upon. Popularly called e-cigarettes or e-pens, these pens come in all forms and contain a wide variety of active ingredients. Are vape pens bad for you? Read on to learn more. The e-liquid contains 85%-90% vegetable glycerin, mixed with propylene glycol and polyethylene glycol. These chemicals act as a carrier for the nicotine or the herbs added to the vape pens. 10%-20% of the ingredients are used to add flavors to it. It can be either food grade flavors, like those used in candies or an essential oil like spearmint. The vape pens also contain 0%-2.5% nicotine content and distilled water for dilution. Yes, vape pens are still bad for you. Vape pens still contain nicotine and other harmful ingredients which will harm your health, although they are considered safer than real cigarettes. Now let's get to know its side effects by analyzing its contents. Glycerine or glycerol is a sugar alcohol, which is used in foods, beverages, drugs or personal care products. It is considered non-toxic and is used to prevent foods from drying out. Though it is safe for use, consuming it in large amounts would lead to dry mouth, throat irritation and an increased thirst. This chemical is considered to be generally recognized as safe (GRAS) by FDA. It is widely used as an additive in ice creams and desserts. At high temperatures, this chemical is converted to small polymers that can damage your lungs. Some vapers experience sore throats and allergic reactions after its use. Still want to know more about "Are vape pens bad for you?" Just read on. It is used in the food industry as an anti-freeze agent. But this polyether compound is low toxic and consumption in large amounts could be harmful. It is the most toxic chemical present in vape pens and it contains 0.5%-3% dry weight of tobacco. A small amount of nicotine is a stimulant, but it can be very toxic in high amounts like 75-100 mg. Nicotine, passing in the blood stream, can cause an increased blood pressure, an accelerated heart rate and light-headedness. We have known that vape pens are bad for you, although they are not as bad as cigarettes. Under this circumstances, some claim that vape pens can help in quitting smoking. Is this true? I'm afraid that using vape pen to quit smoking may be not very effective. As we all know, the best way to quit smoking is to reduce the nicotine intake gradually, but the amount of nicotine in the e-cigarette is undefined and could lead to an addiction. That is because no regulation requires vape pens manufacturers to include the exact ingredients and their compositions on the labels. A vape pen can contain as high as 24 mg/ml of nicotine. Vapers have little control over the nicotine content that they inhale. After the queations "Are vape pens bad for you?" and "Can vape pens really help me quit smoking?" you may want to compare vape pen with marijuana. The vape pens may contain a very high amount of toxic nicotine. Vaping also does not produce strong smell like cigarettes. Therefore, it becomes very difficult to recognize the strong nicotine concentration in vape pens and some may even think it's nicotine-free. In this case, overuse may occur. Moreover, these pens also contain waxes or oils that have very high amounts of THC, or tetrahydrocannabinol which also presents in marijuana and is mainly responsible for its psychological effects. The high concentration of this chemical in vape pens could prove to be more dangerous than smoking marijuana, but due to the lack of smell, you would not recognize them in your pen. 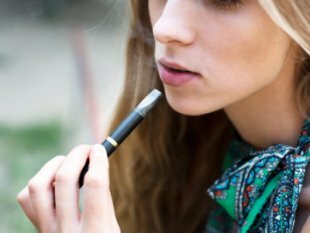 Vaping these chemicals can lead to hallucinations and psychotic breaks. They can be more addictive than marijuana use.